“I wonder if those who contest the security decree have even read it. 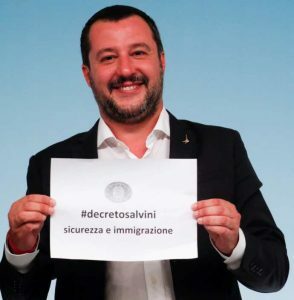 I do not really understand what the problem is: it deports criminals and increases the fight against the mafia, racketeering and drugs.” — Deputy Prime Minister and Minister of the Interior Matteo Salvini. Italy will not sign the United Nations Global Compact for Migration, nor will Italian officials attend a conference in Marrakech, Morocco, on December 10 and 11 to adopt the agreement. The Global Compact not only aims to establish migration as a human right, but also to outlaw criticism of migration through hate crimes legislation. 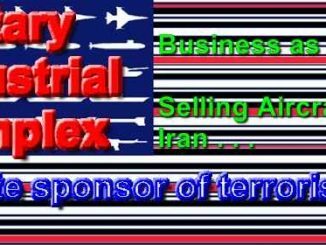 Eliminates Humanitarian Protection. 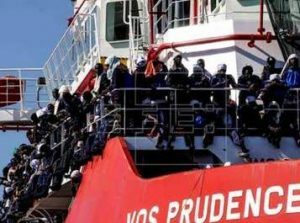 A primary objective of the new law is to limit the number of migrants granted asylum in Italy. To achieve this aim, Article 1 of the decree abolishes residence permits for so-called humanitarian protection, a form of security available to those not eligible for refugee status. Under the previous system, the conditions to qualify for humanitarian protection — one of the three forms of protection granted to asylum seekers, in addition to political asylum and subsidiary protection — were vague and subject to abuse. 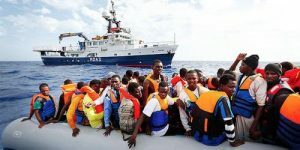 Migrants arriving in Italy were able to claim humanitarian protection, which lasted for two years and provided access to a job, social welfare benefits and housing. Under the new law, the Italian government will only grant asylum to legitimate refugees of war or victims of political persecution. The new law also introduces a series of special permits (for health reasons or natural disasters in the country of origin) with a maximum duration of between six months and one year. Extends Period of Detention for Migrants. Article 2 of the new law authorizes Italian authorities to detain migrants held at so-called repatriation centers (Centri di permanenza per il rimpatrio, CPR) for a maximum of 180 days, up from a maximum of 90 days. The extension is in line with the period considered necessary to verify a migrant’s identity and nationality. In addition, Article 3 provides that asylum seekers may be held for a maximum period of 30 days at so-called hotspots, identification facilities at the EU’s external borders. If identity is not established in the 30 days, asylum seekers may also be held in repatriation centers for 180 days. In other words, asylum seekers may be held for 210 days to verify their identity. Increases Funds for Deportation. Article 6 provides for the allocation of additional funds for repatriations: 500,000 euros ($570,000) in 2018, 1.5 million euros ($1.7 million) in 2019 and another 1.5 million euros in 2020. Eases Revocation of Protection. Article 7 extends the list of crimes for which refugee status or subsidiary protection can be withdrawn. Asylum seekers may now lose their protection if they are convicted of crimes including: threats or violence to a public official; physical assault; female genital mutilation; and a variety of theft charges. The asylum application may also be suspended if the applicant is in a criminal proceeding for one of the aforementioned crimes and would result in the refusal of asylum in the event of a final conviction. Furthermore, refugees who return to their country of origin, even temporarily, will lose international and subsidiary protection. Establishes List of Safe Countries of Origin. Article 7-bis provides for the establishment of a list of safe countries of origin, namely countries which have democratic political systems and where “generally and consistently” there is no political persecution, torture or inhumane or humiliating treatment or punishment, threat of violence or armed conflict. At least 12 EU countries already have such lists, which are used to prevent abuses of EU and national asylum systems. According to the decree, asylum seekers from countries on the list will be required to provide proof that they face danger in their home countries. The law also introduces new categories that qualify an asylum application as “manifestly unfounded” in the case of: people who have made inconsistent statements; people who have made false information or provided false documents; people who refuse to be fingerprinted; people who are subject to deportation orders; people who constitute a danger to order and security; foreigners who entered Italian territory in an irregular manner and who did not immediately apply for asylum. Downsizes the Asylum Seeker Shelter System. Article 12 stipulates that henceforth only unaccompanied minors and those persons who qualify for international protection will be allowed to use the system for the reception of asylum seekers and refugees (Sistema di protezione per richiedenti asilo e rifugiati, SPRAR), the ordinary reception system managed by Italian municipalities. All other asylum seekers will be processed through the Extraordinary Reception Centers (Centri di Accoglienza Straordinaria, CAS) and by Reception Centers for Asylum Seekers (Centri di Accoglienza per Richiedenti Asilo, CARA). The changes are aimed not only at reasserting central control over the asylum process, but also at restricting access to all but the most basic social services. Authorizes Revocation of Citizenship. Article 14 provides for revoking Italian citizenship from those who are not Italian by birth and convicted of crimes related to terrorism. Those subject to revocation include: foreigners who acquired citizenship after ten years of residence in Italy; stateless persons who acquired citizenship after five years of residence in Italy; children of foreigners born in Italy who acquired citizenship after the age of 18; spouses of Italian citizens; and adult foreigners who were adopted by an Italian citizen. The revocation of citizenship is possible within three years of the final conviction for crimes related to terrorism, by decree of the President of the Republic on the proposal of the Minister of the Interior. Article 14 also increases the waiting period to obtain citizenship to 48 months from 24 months. Boosts Security Measures. The new law also introduces rules aimed at strengthening measures to guarantee public safety, with particular reference to the threat of terrorism and the fight against criminal infiltration in public tenders. In an effort to prevent vehicular attacks on pedestrians in crowded places, Article 17 requires car rental agencies to increase controls on individuals who rent trucks and vans. Article 19 authorizes police in municipalities with populations above 100,000 persons to use electric tasers, while Article 24 includes measures to strengthen anti-mafia laws and prevention measures. 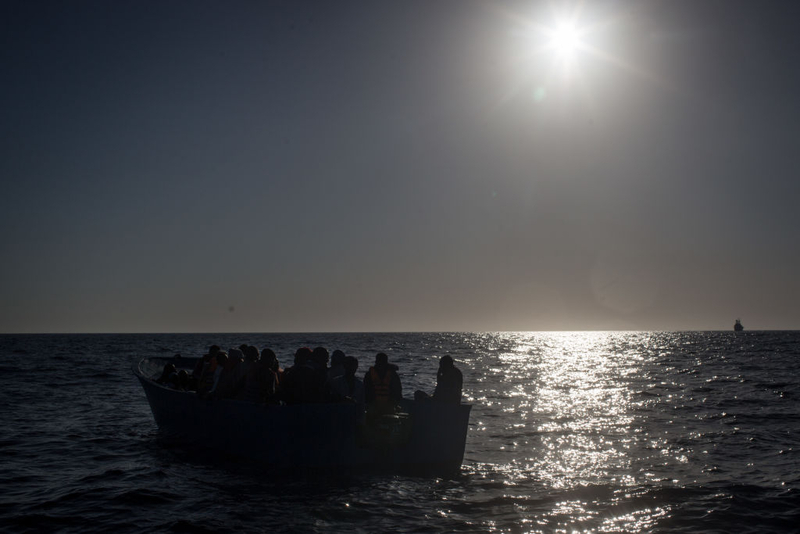 The Italian mafia has been accused of profiting from the migration crisis.